In Japan, there are not only four seasons, but 24 solar terms within the seasons. Just around the Seimei solar term, or when the sakura starts to bloom, is when the whole of Japanese societ y seems to spring forth to a new start. As both the new school term and new work year starts from April, ceremonies that mark the end of one chapter and the start of the next such as graduation and matriculation are held in March and April respectively. It is said that cherr y blossom viewing used to be a sign of respect and prayer for ancestors. Through this prayer for ancestors, a line is drawn between past and present, and one can stride forth into the future. This is a way of parting with one’s past and taking a first step into a new future. best hopes for these employees of f to a new start in their lives. While the form is dif ferent, the spirit remains the same as times past. Rieko Ido A graduate of Kokugakuin University, researcher of ancient Japanese customs and knowledge, conducting technical analysis on ﬁndings to apply them to modern lifestyles. Currently teaches at Tama Art University. PREFECTURE Niigata is one of the largest rice producing prefectures in Japan. The vast Echigo Plain and the Shinano and Agano rivers that moisten the plain are located within the prefecture. e are able to guarantee the quality and freshness of each dish because of this thorough preparation and our policy to only start cooking dishes after we receive the order. We are always dedicated to create more mouthwatering foods to our valued customers. The mineral-rich snowmelt gives the rice a ﬁne / rich taste. The climate of this region—long day light hours and light rainfall in the summer enhances the growth of rice and produces a fragrant rice variety. Koshihikari is the most cultivated rice in Japan. It is highly popular; Koshihikari has become a synonym for excellent rice. The name Koshihikari means that the developers hope to become the shining rice of the country of Koshi. And now, Koshihikari has become one of Japan’s leading agricultural crops known not only in Japan but around the world. SIGNATURE MENU ・Charcoal grilled Saba Fish ・Deep Fried Chicken & Vegetable with Sweet and Sour Black Vinegar sauce ・Home-made Tofu ・And more nice dishes await you!! Japanese Lunches to Feed Your Mood What foods are you feeling today? New quay-side dining experience If you enjoy getting up close and personal with your chef, Chikuyotei’s brand new restaurant has the perfect encounter waiting for you. Grab a counter seat and tantalize your senses as you watch the chef cook your meals fresh in front of you. From their famous umami-rich Kagoshima Black Wagyu to their signature charcoal grilled unagi, every dish is prepared and served with great skill and care. For the ultimate experience, choose their omakase (おまかせ, chef’s choice) dinner course. (U.P. $168) from your second bottle onwards. One must-try specialty is their freshly brewed bowl of soup which uses a carefully prepared 2 year-old dashi (だし, soup stock) made from premium Kagoshima katsuoboshi (鰹ぶし, dry bonito) called hongarebushi (ほんがれぶし, dried ﬁsh ﬂakes). Get ready to shop till you drop Centrally located at Marina Square, the incredibly aﬀordable Midtown Mart is the newcomer to the Japanese mini-mart scene in Singapore. Their wide variety of products are imported from Japan weekly to ensure freshness and quality. Here you will be able to ﬁnd popular snacks such as Cheese Almond Senbei and freshly baked thick-sliced bread from Yamazaki bakery. They also carry Sapporo Ichiban Green Premium Instant Ramen which has an oil-free soup, non-fried noodles and zero cholesterol. It is available in three ﬂavours: Shoyu, Seafood and Duck. Also available are quirky and useful everyday household items like instant ramen cooking bowls, a selection of Calpis drinks, gummies and more. As an extra service you can even make a request at the store for a particular snack that you want and the store might just bring it in. Visit WAttention’s ﬁrst ever Japan Pavilion Singapore’s largest travel fair is back with more exciting booths than ever before – including our very own Japan Pavilion. The pavilion will also feature a number of food booths selling popular traditional Japanese casual cuisine such as onigiri (おにぎり, rice ball), okonomiyaki (お好み焼き), takoyaki (たこ焼き), wagashi (和菓子, traditional Japanese confections) and more. WAttention’s very own booth will be featuring exciting giveaways throughout the day, so be sure to drop by for a visit. Singaporeâ&#x20AC;&#x2122;s Best Kept Japanese Dining Secret Nestled in the heart of Holiday Inn, Ooi is a seasonal kaiseki-style (Japanese traditional set meal) restaurant popular amongst the Japanese expats in Singapore. Famous for its high quality dishes and exceptional omotenashi (Japanese hospitality), Ooiâ&#x20AC;&#x2122;s service is highly personal and dedicated as guests are served only by Mr and Mrs Ooi. Set in an authentic and cosy atmosphere, Ooi is a cosy, elegant dining experience not to be missed. Ohanami involves sitting under a sakura tree and enjoying its natural beauty with a picnic. So bring a mat or sheet to sit on for your ohanami session and a small blanket as it can get cold sitting in the open. Check the dates of the local ohanami festival, where plenty of food stalls and some public events or performances will be set up. This is Kyoto’s most famous temple, with the Arashiyama mountains as a backdrop and a Zen garden – Sogenchi-teien – that has been recognized by the Japanese government as a Special Place of Scenic Beauty. The weeping sakura tree at the Tahoden Santuary is a must-see. This World Heritage Site is famous for its locally-cultivated sakura trees, called the Omuro sakura, which are shorter in height and bloom one week later than the mainstream Somei Yoshino variety. See the timeless beauty of these 200 sakura trees, which have been enjoyed here for over 400 years. See over 60 varieties of sakura trees here, particularly the early blossom of the Sakigake sakura which is said to herald the start of the ohanami season. The shrine’s annual cherry blossom festival is the oldest in Kyoto, dating back to 985 AD. Named after famous philosopher Kitaro Nishida, who meditated daily along this path, the cherry blossoms form a pink canopy over this 1.5km canal route, gently sprinkling petals over its waters. Cited as one of Japan’s Top 100 Walking Paths, there’s no better place to ponder! Go early if you want to get a good ohanami viewing spot! Once used as a ship-transporting railway between canals until the 1940s – the longest incline rail in the world – this 582m track is famous for its nearly 100 Yamazakura and Somei Yoshino cherry trees. The eastside of Niomon Dori is the best viewing spot! The start of the cherry blossom season varies from year to year, but is generally from late March to mid-April in Kyoto (depending on the region). The 12m tall Gion no Yozakura (祇園の夜桜, Night Sakura of Gion) weeping cherry tree here is a Kyoto sakura icon. The night illumination of this and some 680 other cherry trees in four varieties make Kyoto’s oldest park (since 1886) a favourite night spot. The glorious old capital of Japan is rich in culture and tradition with an abundance of activities and sights, but here are some things you just cannot miss. Wondering how to get the best out of your ohanami (お花見, cherry blossom viewing) experience? Fear not, our list of hanami tips will guide you to survive the annual ohanami like a pro. How to hanami: Tips to enjoy cherry blossoms <Tip 1> Bring your own bento box & utensils Indulge in a Hanami Bento, which uses seasonal ingredients so you can relish in the taste of spring. <Tip 2> Keep warm, but remember sunscreen Average temperatures hover around 10 degree Celsius so layer up and bring along some disposable heat packs. Protect against UV-rays by putting on sunscreen, and be prepared for rain. <Tip 3> Buy hanami goods for cheap Visit your local 100-yen shop to get hanami necessities such as picnic mats, folding chairs/cushions, garbage bags and wet wipes. <Tip 4> Take care of your surroundings Make sure you lay your mat further from the delicate sakura tree roots to prevent damage. Do also remember to pick up and sort your litter into burnable trash, plastics and aluminium cans. <Tip 5> Find the nearest lavatory Most hanami sites have long lines and some do not even have toilets, so it is essential to locate one beforehand. Pick up a Bus Pass at any city bus and subway information or ticket oﬃce. Hop on and oﬀ as you like with Kyoto Bus & City Bus One-Day Pass (¥500) that allows you to travel around the Flat-Fare Zone for the day OR enjoy free and easy travelling with the Kyoto Sightseeing One- and Two-Day Pass that allow you to ride all Kyoto City buses, subway trains and most buses run by the Kyoto bus company starting from ¥1,200. When traveling on Non-Flat Fare Routes remember to get a boarding ticket so you know how much your fare costs. Try to put the exact fare into the payment box because change may not always be given. about busing around this quaint city. Remember to board from the rear, alight from the front and pay when you get oﬀ. OMIYAGE for you These food gifts are unique to Kyoto and often exclusively available only in the area. Designed with Hello Kitty’s adorable face, this chocolate treat is made with crushed yatsuhashi, a traditional cinnamon-ﬂavoured cookie made with glutinous ﬂour, and covered with strawberry and matcha ﬂavoured chocolate. Often simply referred to as shichimi, this distinct Japanese seven-spice mixture has subtle ﬂavours and a distinct spiciness that emphasizes the simple yet tasteful fair of Kyoto cuisine. Tea is the quintessential drink of Japan, especially in Kyoto. This tea is well known for its light, refreshing ﬂavour and harmonious blend of sweetness, bitterness, richness, astringency and fragrance. Soft and jelly-like, this traditional confectionery is usually served dipped in kinako (黄粉, roasted soybean ﬂour) and often available in seasonal ﬂavours such as matcha and sakura. From one of the best sake breweries in Kyoto, this female-led brewery has created a refreshing sparkling Junmai sake. This sake is lightly carbonated and best enjoyed with a twist of lemon or lime. Soft and refreshingly sweet, these colourful beans come in ﬁve colours – red, white, yellow, green and brown and are known as auspicious sweets used for celebrations at the imperial court. Singapore’s 1st Halal Japanese Restaurant Experience warm, hospitable service, authentic flavours and a luxurious dining experience in the heart of town with Gion Dining. Writer’s proﬁle: Takashi Nabeoka – MPP. Working with CLAIR Singapore, Secretary-General of Singapore Kyoto Club. Loves travelling around Asia and playing the violin. Joins the Singapore Ice Hockey Association’s games at J-Cube. Yasaka Shrine, Kyoto Once called Gion Shrine, this Shinto shrine was founded over 1,350 years ago and is home to the famous Gion Matsuri which is celebrated every summer with ﬂoats and hundreds of participants. 1.2 million tulips of 120 diﬀerent varieties ﬂourish here in late spring, making it yet another ﬂower paradise. 北海道 The last area in Japan to see blooming cherry blossoms, Hokkaido attracts many outdoor lovers due to its unspoiled nature. Takinoue Pink Moss Park From mid-May to early June, tiny ﬂowers bloom and spread across the entire park, covering all 100,000 square metres in a pink blanket. The spectacular view can even be viewed from a helicopter ride for just 5,000 yen (S$60). Hachimantai Snow Wall The famous snow corridor runs through Towada-Hachimantai National Park and can only be seen between April and May. In some places, the snow walls can reach a height of 6m and look so smooth that they appear to have been sliced by a knife. At Flower Land Kamifurano (フラワーラン visitors will be able to see a variety of seasonal blossoms, and can even experience making and bringing home their very own unique pillow ﬁlled with dried lavender. Northern Japan 北日本 Known for their cherry blossoms’ vibrant colours, Northern Japan has more places famed for hanami than in most regions of Japan. At Morioka’s Tezukuri-mura, visitors can try painting Kokeshi dolls which are originally from northern Japan. Handmade from wood, these dolls are characterized by their lack of arms and legs. Yamadera Temple This scenic temple located at the foot of Hōshū-yama (宝珠山) has exceptional views that have made it a nationally designated Place of Scenic Beauty and Historic Sites (名勝・史跡). Held every year from late March to early May, Tatebayashi’s Koinobori no Sato Festival (鯉のぼ りの里まつり) is the world’s largest koinobori (鯉のぼり, carp streamers) festival where many colourful koinobori of diﬀerent sizes are ﬂown to celebrate Children’s Day. 中部 The Chubu (中部) region is located in the centre of Japan’s largest island Honshu (本州) and home to some of the ﬁnest spots to view sakura. More than 10,000 azaleas bloom here starting from mid-April to end May, including the giant Yamatsutsuji (山つつじ) azaleas that are more than 800 years old. This UNESCO World Heritage Site is best known for their traditional gasshozukuri (合掌造り, clasped hands-style) farmhouses which are picture-perfect during the sakura season. Shikoku 四国 Sakura bloom abundantly in spring, making it a great time to explore the four prefectures of Japan’s smallest major island. One of Japan’s 12 original castles, it is located on Katsuyama Hill (勝山) and provides visitors with a bird’s eye view of Matsuyama (松山) and the Seto Inland Sea (瀬戸内海). During spring, around 200 sakura trees bloom on the castle grounds, making it a wonderful sakura viewing spot. Kyushu 九州 An early centre of Japanese civilisation, Kyushu oﬀers an array of historic treasures and natural sceneries which thrive during spring. Yanagawa Boat Cruise This cruise goes around the moat of the old Yanagawa Castle (柳河城) and as the boat travels downstream, you can enjoy the view of red brick warehouses from the early 20th century and traditional Japanese-style storehouses. Kujukushima Despite its name literally meaning ninety-nine islands, Kujukushima (九十九島) is actually made up of two hundred and eight islands which line the coastline stretching from Sasebo (佐世保) to Hirado (平戸). Mifuneyama Garden Part of the Takeo Domain’s ruler family holiday home, the garden is set against the rocky cliﬀ of Mt. Mifune (御船山). It is the perfect spot for photos with 50,000 azaleas and 5,000 blooming sakura trees. Okinawa 沖縄 Cape Manzamo Famous for its rock formation which resembles an elephant dipping its trunk into the ocean, it is a great place to watch the sunset as it sinks into the East China Sea. The ﬁrst prefecture in Japan to herald the coming of spring. Comprising three major island groups, the Okinawa Islands (沖縄諸島), the Miyako Islands (宮古島) and the Yaeyama (八重山諸島) Islands, this subtropical paradise is famous for its marine wildlife. Ie Island (伊江島) hosts an annual lily festival towards the end of April, where around one million lilies ﬂower and blanket a huge park measuring 86,000 square metres. Designated as a UNESCO World Heritage Site, the castle served as the administrative centre and residence for Ryūkyū kings for several centuries until Okinawa became part of Japan in 1879. Hot Springs & Authentic Cuisine A Taste of Rustic Japan in Tohoku If you are looking for a rural retreat to refresh your body and soul, look no further than the Tohoku region in north-eastern Japan. Consisting of six prefectures, this area boasts some of the milkiest and smoothest hot springs in Japan, a variety of fresh seafood from both the Paciﬁc Ocean and Japan Sea, organic meats from free-range farms as well as abundant fruits made sweet from the distinct change in seasons. Located at the tip of Japan’s main island, Aomori is famous for apple produce, seafood and Nebuta lantern floats. Top-notch sushi at conveyor belt prices You will have a hard time finding sushi of this quality for the same price. The secret behind Ippachizushi’s gorgeous toppings is not only the quality of Aomori’s local seafood, but also the skill of the sushi chef with over 30 years of experience. Do not forget to try the scallop sushi, an Aomori specialty. Cuisine and live music from Aomori The three Nebuta lantern floats hanging on this izakaya's exterior promise an authentic experience and makes it both easy and fun to find! Savour local sake and specialties such as kaiyakimiso (貝焼き味噌, scallops grilled together with miso and egg), and fried shamorokku (シャム ロック, an Aomori chicken breed) while listening to a live tsugaru-shamisen performance. This type of shamisen – a traditional Japanese stringed instrument – has its origin in Aomori Prefecture. The largest prefecture of Japan’s main island, Iwate is abundant with untouched nature. Be sure to savour local noodle dishes and organic meat from the famous farms found here. Iwate recommended sakura spot 小岩井農場の一本桜 Standing in the middle of Koiwai Farm’s grass field with Mt. Iwate in the backdrop, this grand sakura tree is said to have been planted approximately 100 years ago. The contrast with its surroundings makes this unique sakura an ideal spot to visit on this farm! This mountainous prefecture in west Tohoku is also known as “Oishii Yamagata” for its bounty of delicious fruits, rice, water and famous beef. Discover a Different Japan Located to the northwest of Tokyo, the three prefectures of Niigata, Gunma and Nagano are easily accessible by Shinkansen and boast many gems yet to be discovered. Join WAttention editors and embark on a journey through nature and culture! Snow Country Echigo Yuzawa in Niigata Welcome to the snow country described by Nobel Prize winning author Yasunari Kawabata in his novel “Snow Country”. With more than 10 ski resorts, Echigo Yuzawa is a paradise for skiers of all levels. From absolute beginners to experts, everyone can ﬁnd something suited to his or her needs. Echigo Yuzawa is also famous for hot springs that are especially soothing after a few rounds of skiing. Summer is also cool Yuzawa Kogen Ski Resort 湯沢高原 At a mere 8-minute walk from Echigo Yuzawa Station, Yuzawa Kogen is not only a winter wonderland but also oﬀers various summer attractions and activities including hiking and zip-line adventure. Powder snow paradise Naeba Ski Resort 苗場スキー場 50 minutes by bus from Echigo Yuzawa Station, Naeba is one of the most popular ski resorts in Japan and attracts numerous visitors from abroad as well. Everything from accommodations and hot springs to various dining options and fun family activities are all available directly in front of the slopes! While families and kids can enjoy various snow activities in the snow land play area, those who would like to learn skiing or snowboarding can take lessons provided by English speaking instructors. If skiing or snowboarding is not your thing, why not try riding a snow mobile? The staﬀ will give you a basic lesson and guide you through the snow trails. 秋のロープウェイ Catch a ride on Dragondola, the longest (5,481m) gondola lift line in Japan, and glide through the air over the splendour of seasons. The gondola takes you from Naeba to Tashiro, from where you can hop on another ropeway for a diﬀerent view. More to discover Kaisanto Saifukuji Temple 西福寺開山堂 Hiding behind an unassuming façade is the breathtakingly beautiful and exquisite ceiling carving created by Uncho Ishikawa. Drop by and take a look, you will surely be convinced as to why Uncho is known as the Michelangelo of Echigo. Tired of city sightseeing and mainstream tourist attractions? Then see what Gunma has to oﬀer you. A perfect countryside getaway just two hours from Tokyo. Access: About 70 minutes via Joetsu Shinkansen from Tokyo Station to Jomo Kogen Station. Free shuttle bus to Yutorian is available for staying guests. While a roadside station basically functions as a rest area along roads and highways, Denen Plaza Kawaba has evolved to become a tourist attraction on its own and is amongst the most popular roadside stations near Tokyo. From cafés to bakeries and pottery workshops to farmers’ markets, it has everything to keep you and your kids busy for a whole day. Escape from city life and unwind in nature Yutorian 悠湯里庵 Located on an expansive land dotted with seven thatched-roof lodgings, Yutorian is the perfect place to experience Japanese country life. Thanks to the beautiful natural surroundings and soothing hot springs, guests staying in Yutorian can enjoy a relaxing stay in a serene environment reminiscent of old Japan. Outdoor hot spring bath 温泉 Heal your body and mind in the spacious open-air bath. Rooms in the main building even have private outdoor hot spring baths. Course dinner 料理 Enjoy a course meal with a total of 11 dishes prepared using local and seasonal ingredients. Nagano Nostalgia Boasting the highest life expectancy of all 47 prefectures in Japan, people in Nagano seem to exude friendly warmth as naturally as the sun gives out heat. Follow us and discover the charm of Nagano! Access: Karuizawa, Nagano and Iiyama are all easily accessible from Tokyo via Hokuriku Shinkansen. E x tr a c are t ime an d is re quir to ed Tom make ik ur a so ba. 高橋まゆみ人形館 Welcome to the nostalgic world of Mayumi Takahashi’s doll art. Based in Iiyama, Mayumi Takahashi possesses an innate ability to capture the essence of countryside life. Once you step into the museum, you will be impressed by the dolls’ amusing facial expressions and the thoughtfully designed details that capture the heartwarming scenes occurring in everyday countryside life. If trying local food is important to you when you travel, this is the place to be. Because of the harsh winter in Iiyama, people have been using plant ﬁbres to replace wheat in making the local Tomikura soba, which gives the noodles a unique, springy texture. Another local dish you can’t miss is sasazushi (sushi on bamboo grass), a local variation of sushi that has its root as portable food for troops of the famous warlord Uesugi Kenshin. For over 350 years, craftsmen in Iiyama have been making durable Uchiyama washi paper. Here you can try your hand at making washi and creating your one-of-a-kind postcard. Delicious Japanese sake made with local ingredients by local employees. Come and sample the sake of your choice. Highly popular among local people and tourists, the patisserie oﬀers a wide selection of cakes and pastries at reasonable prices. No wonder it’s a neighbourhood mainstay! Everything under one roof Nagano Station & MIDORI Nagano 長野駅 & MIDORI 長野 Nagano Station serves as the gateway to exploring Nagano. It takes only around 90 minutes to travel from Tokyo to Nagano, and all Hokuriku Shinkansen trains make a stop at Nagano. Moreover, the station is a shopping heaven as well! You can get everything you need from souvenirs to a taste of local gourmet at MIDORI Nagano without stepping out of the station building. Find an array of souvenir snacks made using Nagano’s famed honey sweet apple. Hotel Metropolitan Nagano ホテルメトロポリタン長野 Try “Goheimochi” rice cake, a local specialty street food. Directly connected to JR Nagano Station, this modern city hotel boasts a superb location, comfortable guest rooms, and an elegant bar oﬀering creative cocktails and charming night views. Certainly an ideal base to explore Nagano. The Buddha statue enshrined here is said to be the oldest in Japan and no one has ever been allowed to see it. Thus it is known as the “Secret Buddha”. Zenkoji Temple is an ancient Buddhist temple worshipped by many generations. The HondŌ (Main Hall) is designated as a National Treasure, and is also the third largest wooden structure in Japan. The streets leading up to the temple are lined with souvenir shops, stylish cafes and soba restaurants. Hiding in an unassuming alley near Zenkoji Temple, Azumaya is a ﬁne dining Japanese restaurant whose buildings were renovated from 200-year-old Japanese traditional storehouses. Local delicacies served here are as pretty as pieces of art. A great place to experience Japanese hospitality. Karuizawa – Fun all year round The curler. Aim and release! Located right next to JR Karuizawa Station, the Karuizawa Prince Shopping Plaza is a 250-store premium outlet mall. Just under 70 minutes from Tokyo, you can shop for designer labels and local specialties while basking in Nagano’s fresh mountain air. Shiraito Waterfall 白糸の滝 The crescent-shaped waterfall is so named because the water falling oﬀ the rock surface look like hundreds of white threads (shiraito) ﬂowing down. The waterfall is ever ﬂowing in winter because geothermal heat keeps the water temperature at about 11 degree Celsius even in wintertime. The sweeper; the more you sweep, the further the stone goes. The stone is made of granite and weighs up to 20 kg. Find more photos, stories, and suggested itineraries on WAttention website at www.wattention.com! Ascending the Peak of Sushi Excellence with the Freshest Seasonal Ingredients With its headquarters in Niigata, Tomi Sushi creates an authentic dining experience by importing the freshest seafood directly from Niigata Airport to Singapore. Special attention is paid towards the selection of every ingredient, from the premium Niigata Koshihikari rice to natural sea salt and top-grade seaweed. Furthermore, it serves a different type of specially brewed soy sauce for sushi and sashimi respectively. This season, diners will once again be satisﬁed on all levels with the plethora of rich and ﬂavourful maguro dishes which are prepared and presented with considerable care. Cuisine that are inspired by the changing four seasons and set menus that feature a colourful variety of dishes at affordable rates are also highly recommended. Whatever you order, the large selection of Niigata sake will always have the perfect drop to accompany it. Get a well-balanced lunch with these diners that oﬀer healthier options, ingredients or cooking methods. Spoil yourself and pamper your taste buds with these indulgent meals and luxurious settings. Feeling particularly ravenous? Dig into the large portions and wide menu available at these joints. These spots are great for lunches as you can return every day without getting bored. Create your own lavish lunch by choosing an appetizer, two main dishes and complete it with a serving of fragrant rice, miso soup and dessert for a truly savoury experience. Ishinomaki’s extensive lunch menu includes over 20 appetizers, such as chawanmushi and horenso goma (ほうれんそうごま, sesame spinach), fresh seasonal Japanese seafood, Ibérico pork with yuzu miso and beef sukiyaki. One must-try is their popular Sashimi and Unagi set. Indulge yourself with this luxurious lunch feast featuring nine courses including an appetizer, sashimi, wagyu beef, grilled ﬁsh, uni barachirashi don (うにバラチラシ丼, sea urchin sushi rice bowl), foie gras chawanmushi, tempura, clam miso soup, dessert and coﬀee. Z’en’s minimalist and modern setting is suitable for business lunches and casual gatherings with a private area and VIP room that seats up to 20 guests. Discover a Japan Niigata · Gunm Famous for their premium grilled meats, this yakiniku joint also serves up an incredibly aﬀordable bento lunch. Made up of seven dishes—a rice dish, cold dish, deep-fried dish, pickled dish, meat dish, salad and soup—the bento ingredients change on a regular basis so you will never get bored! Famous for fresh, succulent sushi, this is a great option for a healthier lunch spot in town. This set features eight pieces of sashimi, including the popular chutoro (medium fatty tuna), tori karaage (唐揚げ, fried chicken), salad, chawanmushi miso soup and a fruity dessert. Serving a special unagi don (うなぎ丼, sea eel rice bowl) that is only available during lunch, this kushiyaki (串焼き, grilled sticks) joint also oﬀers a wide variety of kushiyaki including fresh seafood, A5 wagyu and pork – a great place for casual dining. At On-yasai, you can savour the rich taste of high quality wagyu and fresh vegetables by simply boiling them in their light and healthy soup stock. Plus enjoy unlimited reﬁlls of their vegetable platter, steamed rice and a drink of your choice (choose from Ice Lemon Tea, Ice Oolong Tea, Ice/Hot Ocha). Looking for a quick meal that is nutritious and satisfying? An onigiri from Samurice will deﬁnitely hit the spot. Made with carefully selected rice from Niigata, Hokkaido and Akita prefectures, these sizeable onigiris come with wholesome ﬁllings such as roasted salmon, plum and sliced Hokkaido konbu (昆布, kelp). Tsukiji$28 Prepared by a skillful Ginza Kyubei-trained chef who uses organic ingredients such as Nagano Koshihikari rice, amber vinegar, freshly imported Japanese ﬁsh and natural mineral water from Hokkaido’s Mt. Daisetsuzan, this set is a lavish experience for your taste buds and comes with six pieces of sushi, a sushi roll, salad, soup and dessert. (worth $3.75) with each purchase of any Combo Curry dish. Japanese curry lovers rejoice! Monster Curry’s signature Combo Curry features the best that Monster Curry has to oﬀer – pork katsu, fried ﬁsh, pork shabu-shabu, shrimp tempura and cheese – on a colossal-sized plate. Available in ﬁve diﬀerent levels of spiciness, these plates are meant for two, or one with a monstrous appetite. *Valid till 31 Mar’16. Dine in only. Stores reserve the right to change the Terms and Conditions without prior notice. Coupons must be presented to avail oﬀer. Coupons can be presented as a photo on your mobile or cut out. Not valid with other promotions. Individual and other in-store Terms and Conditions apply. 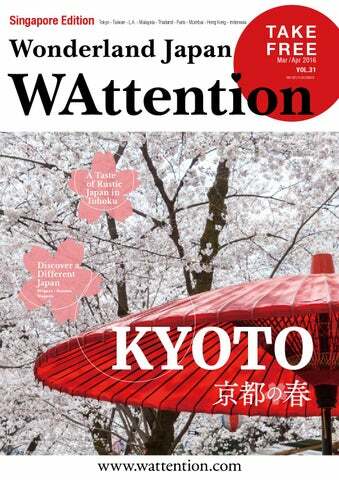 WAttention is a name created by combining “ 和 ” (WA) - meaning all things Japanese - with “attention”, referring to our mission to bring attention to the best of Japan. 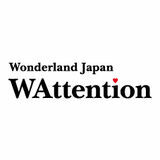 “Wa” also bears the connotation of “linking”, which is what WAttention aims to do as a bridge linking Japan and the world. We are the largest-circulating free magazine to introduce Japan’s unique culture as it is and tourism sights as they are to readers all over the world, in either English or the local language. This hilltop castle is located in Himeji, Hyōgo Prefecture and is one of Japan’s remaining 12 original castles. Dating back as far as 1333, it is also known as Shirasagi-jō ( 白鷺城 , White Heron Castle) for its brilliant white exterior and supposed likeness to a bird taking ﬂight. Widely considered Japan’s most spectacular castle for its grand size, beauty and wellpreserved castle grounds, it has a network of 83 buildings with advanced defensive systems from the feudal period. Unlike many of Japan’s other castles, it was never destroyed by war, earthquake or ﬁre. Historically important ﬁgures who owned the castle include Tokugawa Ieyasu, Ikeda Terumasa and Honda Tadamasa – who built a special tower for his daughter, the legendary Senhime (千姫 , Princess Sen). Named for its diamond-shaped crest, this white gate connects to the San-nomaru area and inner kuruwa ( 曲 輪 , ward). The shortest route to the castle, it is actually a roundabout way to the castle meant to mislead invading enemies. Located 90m above sea level, the top ﬂoor has a pair of Shachigawara that is meant to protect the castle from ﬁre. SkyDesk Media Trek is a free voice guidance app provided by Fuji Xerox that uses the GPS position information of your smartphone to automatically play sightseeing audio guides when you are near a guide point at a location of interest. <STEP 1> Select a [Book] from the Book Store. <STEP 2> Tap [Download] to start downloading. Tap [Open] and [Start Guide] to switch to voice guidance screen. <STEP 3> Voice guidance will automatically start when you are near an audio spot. Created by youngsters a couple of years ago, this term was often used when people wanted to describe something that is “super amazing”. The term originates from the phrase “it is God-like (kami)” and was used to describe something possessed by the supernatural. Teenagers then shortened it to “God-like” and use in the present tense of the verb. Moreover, they write in katakana when communicating on Twitter and blogs despite it being grammatically incorrect as katakana is meant to be used for non-Japanese words. This transformation itself is kamitteru! Conductor Aki Loves exploring how culture aﬀects language diﬀerently around the world and works as copywriter & editor. Also has a postgraduate certiﬁcate in TJFL (teaching Japanese as a foreign language). The concept of omotenashi is almost unheard of anywhere else other than in Japan. In fact, there is no English equivalent of the word, making it even harder to explain. Among the many aspects that deﬁne omotenashi, it is easy to highlight traits like selﬂessness and attention to detail. When I was in Japan, I noticed that even the smallest actions by hoteliers, retailers and service staﬀ spoke volumes in terms of hospitality and service. In simple terms, omotenashi is all about oﬀering the best service without expecting a reward or compensation. I think it would be awesome if Singapore starts recognising and incorporating omotenashi in our everyday lives too! Japanese service staﬀ are often thinking about their guests and how they can make them feel more comfortable and at ease. Let’s see how many ways they can surprise you with the Japanese way of hospitality. At a restaurant 1. Your eyes are tired and you pinch your nose bridge, the waiter notices this and oﬀers you a refreshing hot towel. 2. The waiter places a basket next to the table so that you do not have to place your bags on the ﬂoor. 3. In winter, some cafes have blankets to keep you warm and relaxed. At a friend’s house 1. Your friend may prepare special chopsticks for you to use and present it nicely at the dinner table. 2. Your friend makes an eﬀort to make separate dishes that do not include the ingredients which you cannot eat although you did not mention it beforehand. in a Japanese Multi-National Company? Good Job Creations is your gateway! Good Job Creations (Singapore) Pte. Ltd.
29 Jan 2016 – Held for the ﬁrst time in Singapore, Anime Song Concert Tour (ASCOT) Singapore 2016 featured a line-up of six popular acts from Japan’s anisong and independent scene. NoB Anisong veteran NoB is known for his cool, mature persona and legendary hit song from Saint Seiya, Pegasus Fantasy. He also sang the theme songs for Super Sentai series GoGo Sentai Boukenger and Tensou Sentai Goseiger, and is a member of J-Metal band DAIDA LAIDA. Elisa A classically-inspired anisongtress, Elisa is known for her sweet tones, high range and unique blend of pop-opera music and is famous for her songs from Valvrave the Liberator, The Irregular at Magic High School and Expelled from Paradise. hiJK Bursting onto the scene with their covers of popular anime songs such as Suzumiya Haruhi no Yūutsu’s God Knows and Kantai Collection’s theme song Miiro, hiJK looks set to rock the world with their vibrant personalities, awe-inspiring skills and ﬁerce determination. YOFFY One half of J-Rock band, Psychic Lover, the charismatic YOFFY is famous in the tokusatsu scene as the energetic performer for the theme songs of Tokusou Sentai Dekaranger, GoGo Sentai Boukenger and Samurai Sentai Shinkenger. Kamen Joshi Belying their horror-inspired theme with their infectious bubbly, boisterous energy, Kamen Joshi is an Akihabara idol group that has an explosive presence both on and oﬀ stage. They have a huge fan base and regularly perform in Akihabara. Takayoshi Tanimoto Talented anime composer Takayoshi Tanimoto is the singer of two of Dragon Ball Kai and Konjiki no Gash Bell’s theme songs as well as the opening for the Super Sentai series Jūken Sentai Gekiranger. Join in the rugby fever as Japan’s Sunwolves battle it out with South Africa’s Toyota Cheetahs and Vodacom Bulls respectively! Who will emerge victorious in this year’s Super Rugby Championship? Let’s Talk Subculture Explore the fascinating world of Japan’s subcultures with insights from the inside. 5 Types Of Fun Goods To Support Your Otaku Life By Thanko RARE-MONO Shop Japanese craftsmanship by otaku Thanko RARE-MONO’s products are accessories for otaku, by otaku. At first sight, they might look too bizarre to buy for yourself or as a souvenir, but get your hands on one of these products and you will soon notice that they make the world a better place! Just in case your iPhone is running flat on batteries and you’re on the run, this solarpowered battery case is your lifesaver – and ecological too! Find out other fascinating aspects of subculture in this special “Let’s Talk Subculture” series online at www.wattention.com. making it a drink that can follow you comfortably throughout a meal without you having to worry about keeping it warm or cold. Its tart aftertaste is the main focus of this sake, which makes it ideal to be paired with beef or dishes overﬂ owing with meaty juices. This freshly brewed sake is usually bottled within 10 days after pressing so that its ﬂavour can be enjoyed to the very last drop. win a bottle of sake! Introducing the Singapore’s ﬁrst dedicated Sake subscription site Sakemaru is a sake subscription service that delivers bottles of fresh seasonal sake from diﬀ erent breweries in Japan. Depending on your subscription plan, you will receive one or two bottles of fresh sake transported and delivered chilled right to your doorstep. To begin your Sakemaru journey, simply sign up for an account on their webpage and select a subscription plan. To receive the sake of the month, orders must be placed by the 20th of the same month. Delivery of special sake at the end of every month; you can specify the delivery date and time. Exports only fresh seasonal namazake (生酒 , fresh sake) and uses refrigerated transportation to keep the freshness. Only the ﬁnest breweries in Japan are selected to maintain commitment to quality and taste. Enjoy 50% your ﬁrst order at Sakemaru. Get your ﬁrst bottle of sake for just $25 (U.P.$50).